In the Missions and the Swans. Closed out the week with three more outings for a weekly total of ~90 miles and ~27000′ vertical. I was quite tired from Pyramid Buttes Sweeney on Thursday, and just did a short run to the top of Sentinel on Friday with Louie. He really has a hard time with the heat. Even in the evening it’s been in the mid to high 70s, and he can’t deal with that. So we went slowly. 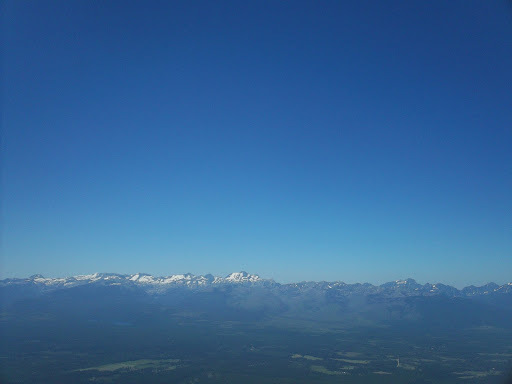 On Saturday, I met up with friends Perry and Clair for an attempt on Greywolf Peak. This spring, Perry and I skied Greywolf’s classic west couloir, but this line does not include a summit visit. 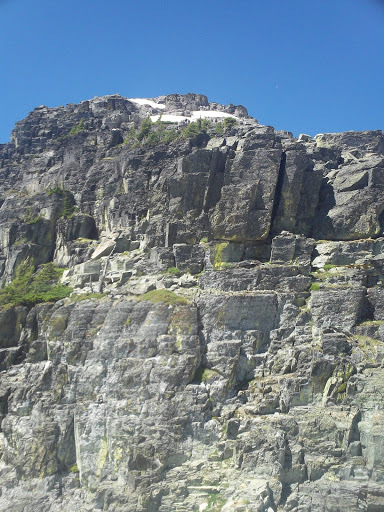 This time we were hoping to climb the northeast ridge, which is the standard summer route. The south couloir almost looked skiable still. There is still a surprising amount of snow in the Missions. More on that in a minute. As we made our way up the basin, we were overcome by patriotism on account of this American Bald. Perry assessing the feasibility of downclimbing around the giant death cornice via its moaty bowels. The pictures don’t really do justice to the consequences of this terrain. If one fell in either direction crossing that snow, death was pretty certain. 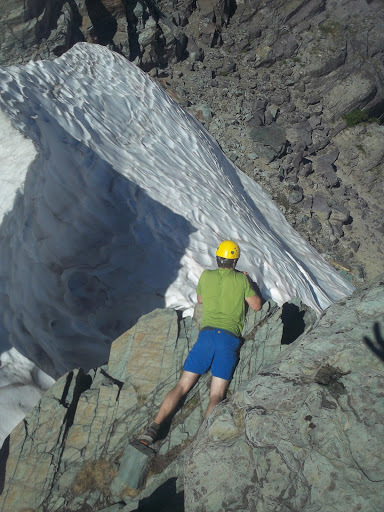 There was also a significant amount of snow still on the north ridge. It would have been easy to navigate with crampons and an axe, but not being so equipped, the combination of exposure, difficult climbing, and non-ideal conditions provoked the decision to call it quits on the summit bid. 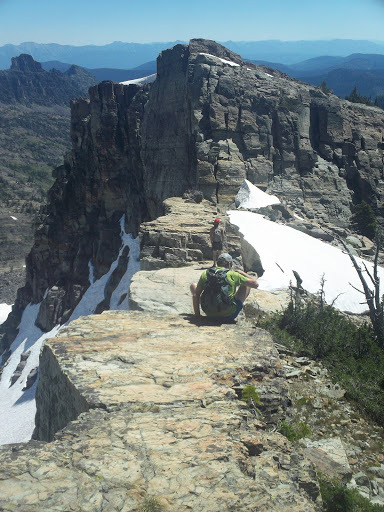 Despite being turned around 500′ from the summit, the views were spectacular, and the journey to the notch is well worth the trip. There is still so much snow in the Missions! A dedicated skier could easily get several thousand feet of corn skiing in, and it’s almost August. Upper 4th class on the other side of the notch. I felt quite good after the hike up Greywolf, and decided to go for a longer run on Sunday. I feel as though I’ve been doing alot of scrambling lately, which translates to alot of not running on these outings. Thus, I resolved to go somewhere with trails the whole way, specifically trails that likely have been cleared in the last 2 years, so that I could see what it feels like to run continuously for the kind of distances I’m going to see in the upcoming race. I was also inspired by the previous day’s view of the incomparable Swan front to visit that range. 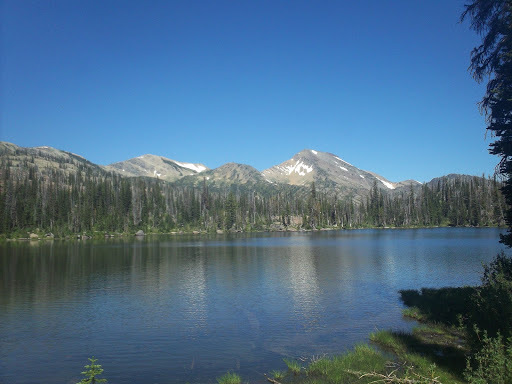 Holland Lake is a major access point, and I was able to determine a desirable loop route that would pass by three sets of jewelry themed lakes, as well as visit a decommisioned lookout. The drive from Missoula was long, and it was almost 9 by the time I left the truck. I ran hard out of the gate and made it to Upper Holland Lake in about an hour, trying hard to push through the steeper technical sections. From Upper Holland, it’s only another 600′ vertical to the first pass of the day, Pendant Pass, from which views of the interesting geology of Carmine Peak are excellent. Belt shales on Carmine Peak. 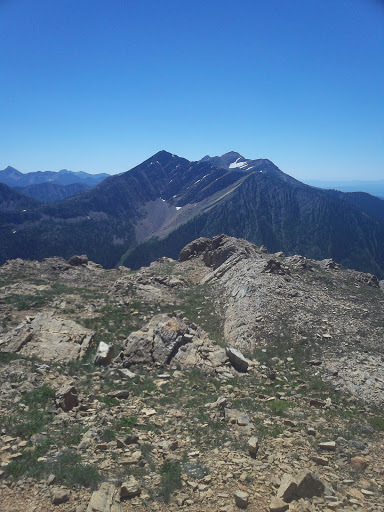 From Pendant Pass, it was a fast and rocky schuess down to Big Salmon Creek with occasional views of red rocky breaks. This was my first time in the Bob Marshall proper, and I am now really looking forward to coming back and fishing the lakes and these medium-sized creeks. At the intersection of Big Salmon Creek and Smoky Creek (my route back up to the front), I ran into a giant party of hung-over cowboys, all of whom were wearing 10 gallon hats, chaps, sleeveless T-shirts, and pistols. They were arranged in a giant dirt circle, and gave me hard looks when I ran past. 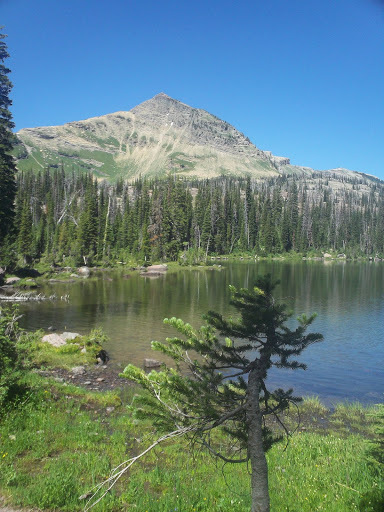 The run up Smoky Creek was standard fare until reaching the Necklace Lakes, when the timber opened up offering views north to Buck and Holland Peaks. 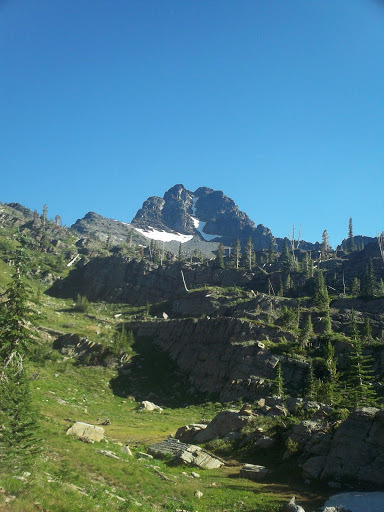 Another 20 minutes had me on Necklace Pass, where a really steep and narrow spur trail takes off to the old Holland Lake lookout at 8000′. This was my only walking of the day, which was really nice. From the lookout, the amount of snow remaining in the southern Missions is obvious. 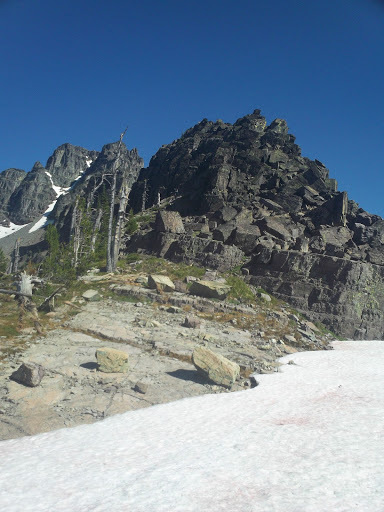 There remain several thousands of feet of snow below the Glacier Peaks (second from right in the snowy group), and on the East Face of MacDonald (rightmost member of the snowy group). Snow in the Southern Missions. 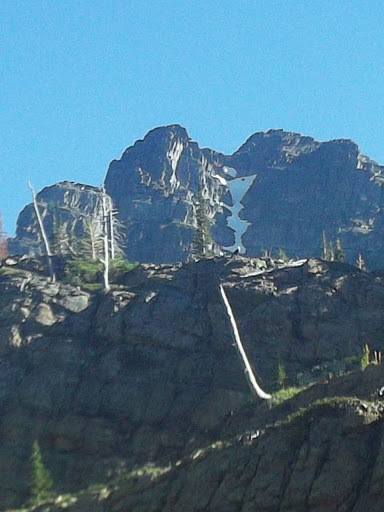 Although these peaks are not much higher than the Swan crest, the amount of snow ice decidedly different, as is obvious by these views north and south. Perhaps it’s a lake effect thing, or maybe a function of the local topography (the Missions have lots of little bedrock undulations that trap drifts). 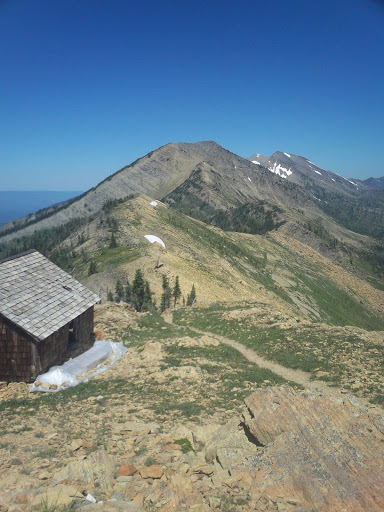 The route from the lookout back to the trailhead is 4000′ of technical running down loose dirt and bedrock steps, past the lovely Sapphire Lakes, Upper Holland Lake again, and the huddling masses ascending the trail at 1:00 in the afternoon in 90′ heat. I was slowed briefly by the same cowboys I had encountered earlier as they parked on the trail while deliberating which fork to take. 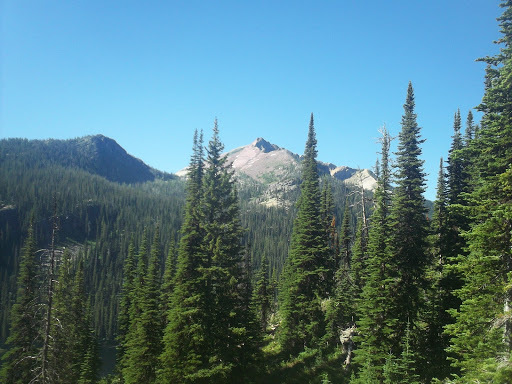 My legs were pretty well spent by the time I exited the Holland Creek canyon and the heat was extreme, and the last mile was rather uncomfortable, but I guess that’s to be expected. Previous PostRunning race courses and continued gendarmigans.Next PostBeing frightened of heights and bears.